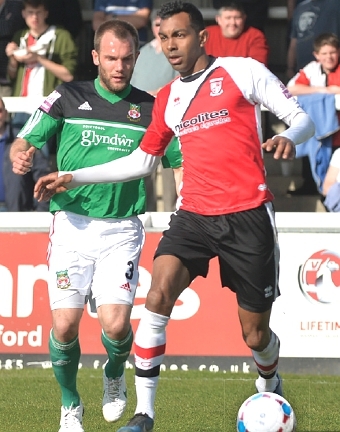 KEVIN BETSY has announced he will bring an end to his illustrious Woking career at the end of the season. The veteran, who graduated from the Cards’ academy as a teenage sensation, made his announcement to fans via social media on Monday night. He said: “This will be [my] final season playing at Woking FC; thank you to the club and all the supporters for everything. You helped me live my dreams. Betsy, who turns 37 next month, signed a one-year contract extension last summer, but suffered a knee ligament injury shortly afterwards, which meant he missed the first two months of the current campaign. 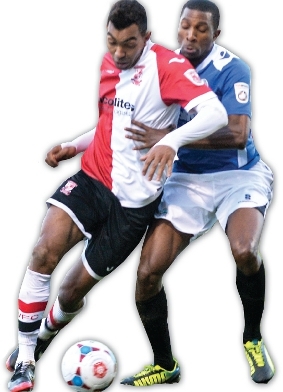 Club Press Officer, John Moore, told the News & Mail: “Kevin Betsy is still a Woking player, and being the ultimate professional that he is, I have no doubt he will continue to give his all until he’s played his last game for the club. A fresh-faced Betsy first burst on to the scene at a time when the News & Mail’s Publisher, Jon Davies, was the chairman at Kingfield. He recalls Kevin as a ‘polite and talented young man’, who back then ‘had ambition to play at a high level of football’. “Kevin has been a great asset for the club during the years that he has played at Woking,” said Jon. Having made his first-team debut at the age of 19 as a substitute in a 1997 away game to Macclesfield Town, Betsy quickly set the Conference division alight with a series of eye-catching displays. After 60 appearances for the Cards, in which he notched up 10 goals and picked up the league’s Player of the Year award in his first full season, he soon became the focus of transfer speculation. Among his suitors were soon-to-be England manager Kevin Keegan, who at the time was in the hot seat at Fulham. 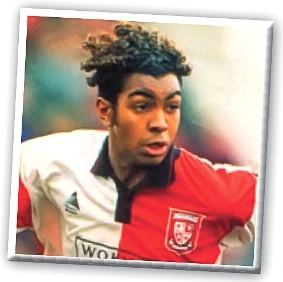 A sensational six-figure transfer fee was enough to prise the youngster away from Kingfield and propel him on to the lofty heights of the old First Division. And the setting for his Cottagers debut could not have been more impressive, as Betsy was thrown into the Anfield cauldron for a League Cup tie against Liverpool in September 1998. Jon Davies added: “It gave me great pleasure to watch him run out at Anfield against Liverpool for Fulham, knowing that he came through the youth ranks at Kingfield. After playing his part in Fulham’s promotion campaign, Betsy fulfilled his ambition of playing in the Premier League when he came on as a substitute for Jean Tigana’s Fulham against Manchester United, at Old Trafford in 2001. Having left Craven Cottage the following year, a long and wind-money move, this time to Bristol City from Wycombe Wanderers. However,it was in April 2012 that current Kingfield boss, Garry Hill, made the call to bring Betsy back to Woking. 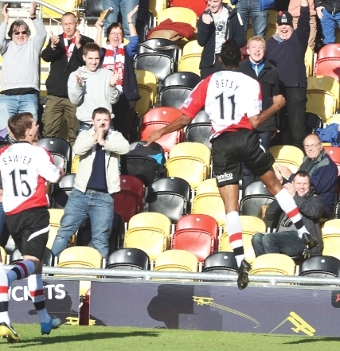 And with their prodigal son back in their ranks to aid their promotion push, Cards’ fans were soon celebrating, as the club duly ended their three-year hiatus from Non-League football’s top-tier, by claiming the Conference South title. Quickly back into his stride in the familiar red and white shirt, Betsy fired 14 goals in each of the Cards’ subsequent two seasons back among Non-League’s big-hitters, to help the club re-establish itself whereit rightfully belongs – at least that’s what Cards fans would say. And who knows? The sweetest of swansongs could yet be on the cards. Woking have knocked on the door of the promotion promised-land this season after a sensational first half to the campaign. Should fans’ dreams come true, who could deny Betsy a fitting end to his Kingfield career in the Conference play-off final at Wembley Stadium on May 17? That’s a stage he hasn’t yet graced during his 18-year playing career. Once he does hang up his famous No 11 shirt for the final time, Betsy has plenty to keep him occupied. As well as coaching Fulham’s youth sides for the past six years, he also has his eponymously named charity foundation to take care of, developing football skills and coaching in the Seychelles.